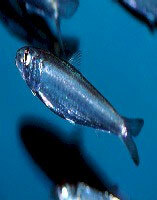 This schooling fish lives in a great deal of the oceans and seas, preferring the open waters and coastal ocean zones. It has a compact torpedo shape, with a pointed snout and a strong crescent tail, ideal for bursts of speed. It is dark blue-gray on top, fading to silver white below, and has several dark, wavy lines on its upper sides. It is a popular game fish because of its speed and strength, and can averages 32 inches and 20 pounds, but has been caught as large as 48 inches. English language common names include little tunny, Atlantic little tuna, Atlantic little tunny, bone-eater, bonito, false albacore, little tuna, and mackerel tuna. European language-based common names include alletterato (Italian), apluro (Portuguese), atuncito (Spanish), bacoreta (Spanish), barrilete (Portuguese), bonite queue raide (French), bonito-pintado (Portguese), cachorra (Creole), cachorreta (Creole), cachorrinha (Creole), carachana (Spanish), carachana pintado (Spanish), falscher bonito (German), fule-fule (Portuguese), gueule molle (Creole), melena (Portuguese), melva (Portuguese), merma (Portuguese), ravil (French), thonine (French), thunnin (Danish), tonina (Maltese), and tonnetto (Italian). Other common names are atlanticheskyj malyj tunets (Russian), atlantiese kleintuna (Afrikaans), balamydah (Arabic), karvouni (Greek), luc (East Adriatic Coast Slavic languages), taiwan yaito (Japanese), ton mic (Romanian), and tunek atlantycki (Polish) as well as the Scandinavian names of tunniina (Finnish), tunnin (Norwegian), and tunnina (Swedish). 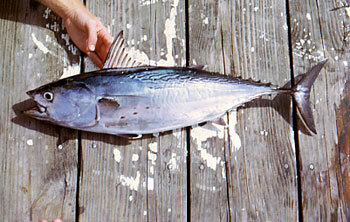 The little tunny is commercially important in many locations including the West Indies. 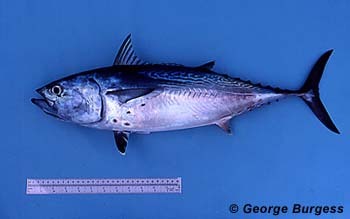 The flesh of the little tunny is darker and stronger tasting than that of the other large tunas. It is marketed fresh, dried, canned, smoked, and frozen. There have been reports of ciguatera poisoning related to human consumption of this fish. It is often caught on hook and line by trolling with lures near reefs. Also it is considered an excellent game fish due to their hard fighting ability once hooked. The little tunny is frequently used as a bait for shark and marlin fisheries, primarily due to their high oil content and good hook retention. > Check the status of the Little Tunny at the IUCN website. The little tunny is found worldwide in tropical to temperate waters, between 56°N-30°S. 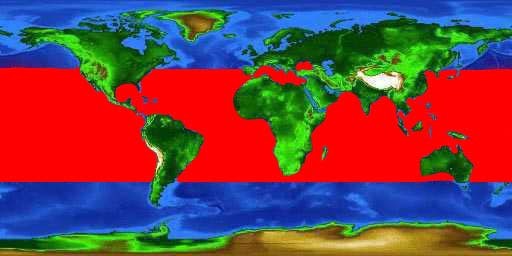 In the western Atlantic Ocean, it ranges from Massachusetts (US), south to Brazil, including the Gulf of Mexico, Caribbean Sea, and Bermuda. It is the most common scombrid in the western north Atlantic. Other locations include the Mediterranean Sea and the Black Sea. This fish is typically found in neritic waters, inshore over the continental shelf in turbid, brackish waters. 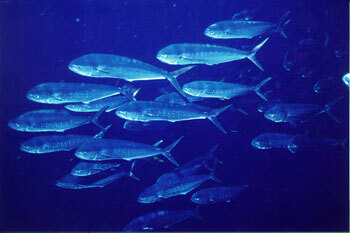 Adult little tunny school according to size with other scombrid species at depths ranging from 3-490 feet (1-150m). However, during certain times of the year the schools break apart with individuals scattering throughout the habitat. Juveniles form compact schools offshore. The little tunny has a robust, torpedo-shaped body built for powerful swimming. The mouth is large, slightly curved, and terminal with rigid jaws. The lower jaw slightly protruding past the upper jaw. There are two longitudinal ridges on the tongue. Scales are lacking on the body except for the corselet and the lateral line. The corselet is a band of large, thick scales forming a circle around the body behind the head, extending backwards along the lateral line. The lateral line is slightly undulate with a slight arch below the front of the dorsal fin, then straight to the caudal keel. The caudal fin is deeply lunate, with a slender caudal penduncle including one short keel on each side. The first dorsal fin has high anterior spines giving the fin a concave outline, separated only narrowly from the second dorsal. Pectoral fins are pointed and short, not reaching to the end of the first dorsal; the pelvic fins are inserted just behind the origin of the pectoral fins. Swimbladder is absent. This fish is steel blue with 3-5 broken, dark wavy lines, not extending below the lateral line. The belly is white and lacks stripes. There are 3-7 dark spots between the pelvic and pectoral fins. Spots below the pectoral fin are dusky. The average size of the little tunny is up to 32 inches (81 cm) in length, weighing up to 20 lbs (9.1 kg). The maximum recorded size is 48 inches (122 cm) and 35.3 lbs (16 kg). The little tunny may live to 10 years of age. Females reach maturity at 10.6-14.6 inches (27-37 cm) in length while males mature at approximately 15.7 inches (40 cm). Lower jaw protrudes slightly past the upper jaw; there is a single row of small, inwardly curved teeth with similar teeth on the palatines. Teeth are absent on the vomer and tongue. Little tunny is an opportunistic predator, feeding on crustaceans, clupeid fishes, squids, and tunicates. It often feeds on herring and sardines at the surface of the water. Spawning occurs in April through November in the eastern and western Atlantic Ocean while in the Mediterranean Sea spawning takes place from late spring through summer. Little tunny spawn outside the continental shelf region in water of at least 77°F (25°C), where females release as many as 1,750,000 eggs in multiple batches. The males release sperm, fertilizing the eggs in the water column. These fertilized eggs are pelagic, spherical, and transparent, with a diameter of 0.8-1.1 mm. The yolk is rich in black pigment and the egg is a light amber color overall. There is a single droplet of oil within the egg, adding to its buoyancy. Larvae, approximately 3 mm in size, are released 24 hours after fertilization, with the yolk being completely absorbed within the first 48-66 hours of life. The eyes are unpigmented at hatching, with pigmentation appearing 48 hours later. A small caudal spot is present. At sizes of 3.7-14mm, the teeth develop, the head becomes large, the snout long, and the fins develop. Juveniles from 14mm-174mm in length take on the adult appearance with the body becoming more fusiform and elongate. 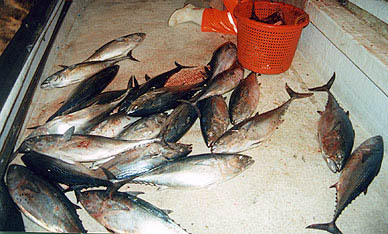 Other tunas, including conspecifics and yellowfin tuna (Thynnus albacares). Fishes such as dolphinfish(Coryphaena hippurus), wahoo (Acanthocybium solandri), tlantic sailfish (Istiophorus albicans), swordfish (Xiphias gladius), and various sharks as well as other large carnivorous fish all prey on the little tunny. Seabirds also prey on small little tunny. Parasites of the little tunny include the copepods Caligus bonito, Caligus coryphaenae, and Caligus productus, all found on the body surface as well as on the wall of the branchial cavities. Another copepod,Pseudocycnoides appendiculatus, has been documented as parasitic on the gill filaments. Other parasites include digenea (flukes), monogenea (gillworms), cestoda (tapeworms), and isopods. 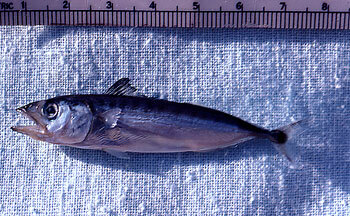 The little tunny was first described by Rafinesque in 1810 as Euthynnus alletteratus. He also referred to this fish asEuthinnus alleteratus, Scomber alleteratus, Pelamys alleterata, Gymnosarda alletterata, Euthynnus alleteratus alleteratus, Gymnosarda alleterata, Euthynnus alliteratus, and Euthynnus allitteratus. The genus name Euthynnusis derived from the Greek “eu” = good and “thynnos” = tunna. Synonyms referring to the little tunny include Scomber quadripunctatus Geoffrey St. Hilaire 1817, Euthynnus quadripunctatus Geoffrey St. Hilaire 1817, Thynnus leachianus Risso 1827, Thynnus thunina Cuvier 1829, Euthynnus thunina Cuvier 1829, Orcynus thunnina Cuvier 1829, Thynnichthys thunnina Cuvier 1829, Thynnus brasiliensis Cuvier 1832, Thynnichthys brevipinnis Cuvier 1832, Thynnus brevipinnis Cuvier 1832, and Euthynnus alletteratus aurolitoralis Fraser-Brunner 1949.The family Scombridae includes the mackerels and tunas and includes 15 genera and 49 species worldwide.